Siggy’s Good Food in Brooklyn Heights Will CloseThe last day is March 1. Brooklyn Hotel-Rooftop Bar Boom Will Likely Hit BK HeightsThe historic Bossert Hotel building is in the process of being approved as a hotel with restaurant and rooftop lounge. B&B Empire Reopening in Brooklyn HeightsCould this mean round two of the Brooklyn bagel battle? Baluchi’s to Spice Up Brooklyn HeightsSamosas in a cursed space. Another Restaurant Slammed for Poor ServiceDon’t make an old lady eat cake with a spoon. Oceana Adds Lobster-Roll Cart; New Catch Herring Season BeginsAnd more, in our daily roundup of neighborhood news. Eamonn’s Bounces Back With 25-and-Over Policy“Any illegal activity will not be tolerated” at the neighborhood pub. Beba Launches Late-Day Brunch; Egyptian Espresso Comes to Ditmas ParkPlus more, in our daily roundup of neighborhood news. River Deli Brings Pane Carasau to Brooklyn HeightsAn enterprising couple transforms Brooklyn’s River Deli into a 42-seat Italian restaurant. Inside Crop to Cup Cafe Co., Now Open in Brooklyn HeightsThe retail co-op is open on Atlantic Avenue. Turn Your Loft Into a Farm; Dunkin’ Donuts Seized in Prospect ParkPlus: The Richardson extends its hours, and Char No. 4 sells Easter hams, all in our daily roundup of neighborhood news. West Village Welcomes New Fish Shack; Frank Alums Expand to Fort GreenePlus: Robert Sietsema on White Castle pulled pork, and another coffee shop for the Slope, in our regular roundup of neighborhood food news. Manhattan’s First Checkers May Open TomorrowThe Tribeca location will open imminently. Checkers Opening Soon in Brooklyn HeightsThe first franchise of its kind in Brooklyn. Brooklyn ComebacksTotonno’s and Armando’s will return to their former homes. Five Guys Grows in BrooklynThe D.C. chain is expanding in Brooklyn. Plus, video of Obama’s Air Force One burger. Ridiculous Rumor: Is Hooters Landing in Brooklyn Heights?If it happens, how will Hooters appease the New Brooklyn Cuisine crowd? Can’t Beat ’Em, Join ’EmThe reopened Gristedes in Brooklyn Heights is hoping to take on Peas & Pickles with healthier products. Busy Chef Manager Locked Out of Ransacked ApartmentDan Kaufman gets a taste of his own medicine, more or less. 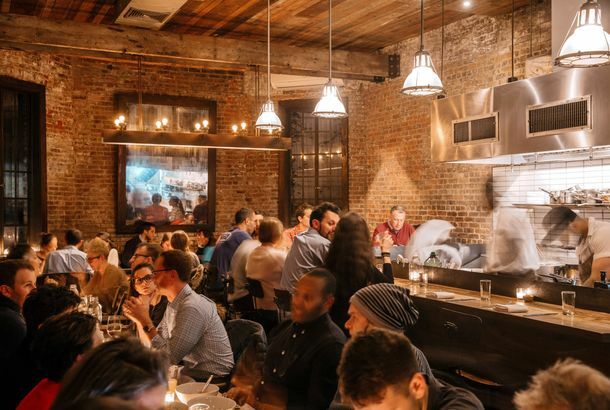 Vegan Dumplings at Rickshaw; Grand Street Gourmet ShuttersBrooklyn Heights feels the reverberations of an accused-con-man restaurant manager, and R&L restaurant sees another setback, in today’s neighborhood food news. Brooklyn’s Busy Chef Restaurant ClosesThe Busy Chef closes, and its owner’s arrest might have something to do with it. Busy Chef Manager Out on Bail, Boston Victims Step ForwardThe Busy Chef manager has been busy for a while, apparently. Tazza Says, ‘No Internet for You!’Tazza is taking no prisoners when it comes to laptop usage.